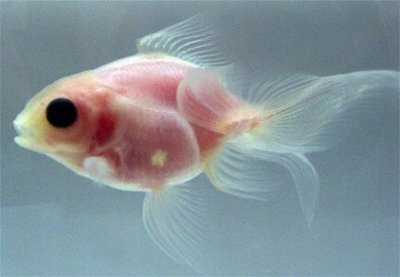 Tokyo - A team of Japanese researchers succeeded in developing goldfish with transparent scales and skin so that its organs and muscles can be seen. A joint team from Mie University and Nagoya University that conducted the research spent two years producing the transparent creatures. They expect some demand for such goldfish as their organs and blood can be observed without dissections, which have become more controversial these days. Some goldfish could grow and weigh about 2 kilograms, much bigger than other fish widely used in experiments such as zebrafish, news reports said. "As goldfish are bigger, it would be easier to observe how illness could affect its organs. It would be also easy to make goldfish produce proteins, look into them in the living body and make use of them for drug discovery research," Yutaka Tamaru, associate professor of bioresources at Mie University, was quoted by Asahi newspaper.